We are considered as top most manufacturer and exporter of various soap making machineries as well as detergent cake plant, Laundry Soap Plant, Detergent Soap Plant, LABSA Plant, Toilet Soap Plant, Acid Slurry Plant and pilot plant. 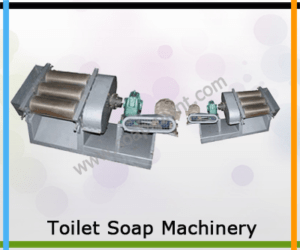 Toilet soap machinery is provided as complete synchronized plant. It contains various machineries like Simplex plodder, worm conveyor; foot operated stamping machine and packing machine. Toilet soap machinery can be set as batch type operations and also for continuous operations. It is provided with flow indicator and PH sensors. It performs so punctually with highly precise equipments like dosing pump, gear and motors. Toilet soap machinery is specially designed to abolish human errors with PLC based control system.